Amaravati, April 11: Voting began in 25 parliamentary and 175 assembly constituencies of Andhra Pradesh on Thursday in the first phase of general elections. 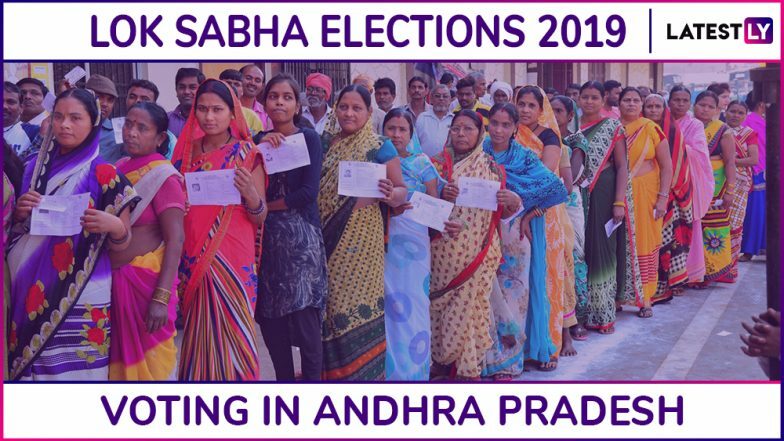 The overall voter turnout recorded from the Andhra Pradesh parliamentary constituencies at the time of ending of polls was 78 percent. Amid reports of non-functioning of Electronic Voting Machines (EVMs), Chief Minister and TDP president N Chandrababu Naidu demanded repoll in around 150 polling stations. Workers of TDP and YSRCP clashed with each other in Anantapur. One worker of each party reportedly died in clash. There are reports of delay in voting at a number of polling booths in Andhra Pradesh due to malfunctioning EVMs. After reports of glitches in EVMs at several polling stations, the ruling Telugu Desam Party (TDP) asked the Election Commission to conduct repoll at affected booths. The fate of 319 candidates for Lok Sabha seats and 2,118 candidates for Vidhan Sabha seats will be sealed in the electronic voting machines (EVMs). A little over 3.93 lakh voters, including 1.98 crore women, are eligible to cast their votes. Andhra Pradesh will see a three-cornered electoral contest between Chandrababu Naidu, Jagan Mohan Reddy and Jana Sena leader and actor Pawan Kalyan. The Bharatiya Janata Party (BJP) and the Congress are also in the fray but their prospects appear bleak. As many as 46,120 polling stations have been set up where registered voters can exercise their franchise. Pawan Kalyan Says Chandrababu Naidu Will Lose Andhra Pradesh Assembly Elections 2019. Elaborate security arrangements have been made in all 13 districts of the state. In order to ensure violence-free polling, 55,000 state police force, 60 companies of Andhra Pradesh Special Police (APSP), 5,666 personnel from other states and 197 companies of the central armed police forces have been deployed across the state. This is the first full-fledged election after the bifurcation of Andhra Pradesh. Andhra Pradesh: Congress to Contest Upcoming Assembly and Lok Sabha Elections 2019 Alone. Union Ministers Kishore Chandra Deo, Ashok Gajapathi Raju, Kotla Surya Prakash Reddy (all TDP), MM Pallam Raju and JD Seelam of the Congress, BJP's D Purandeswari, Kanna Lakshminarayana and former CBI Joint Director VV Lakshminarayana (Jana Sena) are among the prominent candidates contesting the Lok Sabha elections from the state. Key candidates for Assembly polls include Naidu, his son Nara Lokesh, his brother-in-law and actor N Balakrishna, Jagan Mohan Reddy, Pawan Kalyan and state Congress chief Raghuveera Reddy. In 2014 assembly elections, the TDP had won 102 seats whereas it's then ally BJP had bagged four seats. The YSRCP had won 67 seats. Two Independents were also elected. In the simultaneous elections held for the Lok Sabha, the TDP had bagged 15 seats while the BJP got two. YSRCP candidates were elected from eight parliamentary seats.